The National Park Pelister is located in the southern part of Macedonia, on the Baba mountain. The relief of this park is extremely mountainous with alpine characteristics. The mountain range of Baba, which belongs to the park possesses 25 peaks with a height above 2,000 m. The highest peak is Pelister, which appears particularly impressive with its 2,601 m. The attention of the tourists and the mountaineers, besides by the high mountain peaks, is also attracted by the other features of the mountain landscape: forests, rocks, springs, etc. Distinctive localities include Begova Česma, Jorgov Kamen and Crveni Steni. The Pelister National Park possesses a rich hydrographical network of mountain rivers, streams and numerous springs. Still, the two glacial lakes attract the most attention - Golemo and Malo Lake, famous as "Pelisterski Oci"/ eyes. These lakes are found on the way to the highest peak, and are easily accessible. They present a really pleasant and rare spectacle for tourists and mountaineers. 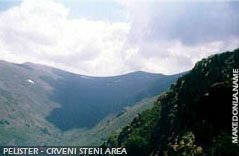 The climatic characteristics in the Pelister National Park change depending on the height. In areas lower than 1,200 m the climate is basically moderate-continental, but also expresses the influences of a mountain climate. In this part of the park, the children's resort is located near the village Magarevo, at the height of 1,100 m to 1,220 m .The higher areas are characterized by a continental climate, and starting from 1,800 m, one can easily feel the mountain climate. Above 2,400 m the mountain climate gains certain alpine characteristics, with an average temperature of 1,3 to 2,30C. Such climatic conditions enable the development of summer tourism, mountaineering, and because of the large snowfall, also winter sport tourism. The slopes of the mountain Baba during the entire winter period, till April are covered with thick snow. The Pelister National Park is full of a rich variety of flora and fauna: beech and oak woods, mountain pastures, numerous healing herbs and various fruit: including strawberries, raspberries, blackberries and blueberries. The picking of these fruits is, one of the motivations of visitors to these areas. 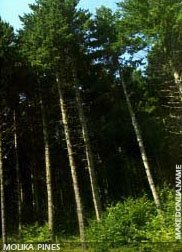 The molika woods, are particularly representative of the significant natural wealth of this area. As an endemic species, which is rarely found in other areas, it has scientific as well as aesthetic value. The fauna in the park is diverse and interesting. Several types of unusual birds can be found in this area, such as the grey eagle, grey falcon, wild pigeon and partridge. Of the fish species - Pelagoniska trout, and of the animals: the lynx, which is very rare in Macedonia, the doe, the wild goat, the bear, the wild cat and numerous other mammals, insects and amphibians. In the western part of the Pelister National Park, the unique settlement of Malovišta is located. Maloviste village is particular for its original traditional architecture and nearby there is a monastery. This Vlach village, isolated in the mountains of Pelister, has preserved some old customs, the folklore and their colorful traditional costumes, especially as a tourist attraction for the visitors to the park. Here, one may taste the specialties of the Macedonian national cuisine, as in the other villages in the park: Niže Pole, Dihovo, Magarevo, Trnovo and others, which are all ethnographically rich.